To manage my upgrades on my more complex games, I use a spreadsheet that lists the item, quantity, current level, next level, max for the TH level I'm on, how much it costs to do the upgrade, and how long it will take me to complete the upgrade. I use sorting orders that suit my needs at the particular time, and for rushed games I even include the max for each TH level below the one I'm at. This gives me a quick, bird's-eye view of my entire game so I can plan my upgrades accordingly. Everything that is already maxed out has been moved to the bottom to get out of my immediate view. Simply put - there's nothing else for me to do with these structures. My current goal is to get everything up to the equivalent of a maxed TH9 (except walls). Of those structures remaining, most are either there or getting real close. This also shows my upgrade strategy for this game. Upgrade strategies will change depending upon the focus of a particular game. In this case, I've been focused on recovering the game to a rushed TH11 (TH11 offense with TH9 defense). 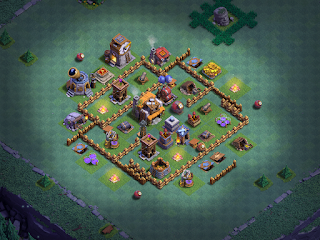 Heroes, traps, and walls represent a lower priority than other defensive structures. Splash damage capable defenses have been given a higher priority over most point defenses because they're more intimidating to raiders. Likewise, my base's core defenses have been given higher priority both because they're needed to protect DE and because they're intimidating (infernos are maxed for TH11, for example). In addition to these, I also have a "shield base" as I call it that I use on each game to get the quick view of the structures, what I have currently upgrading, and even what I want to upgrade next. The far left column of this base has things that are coming up in the upgrade rotation. The order of the items on the base (top to bottom, left to right) correspond to the default sort order in my spreadsheet. 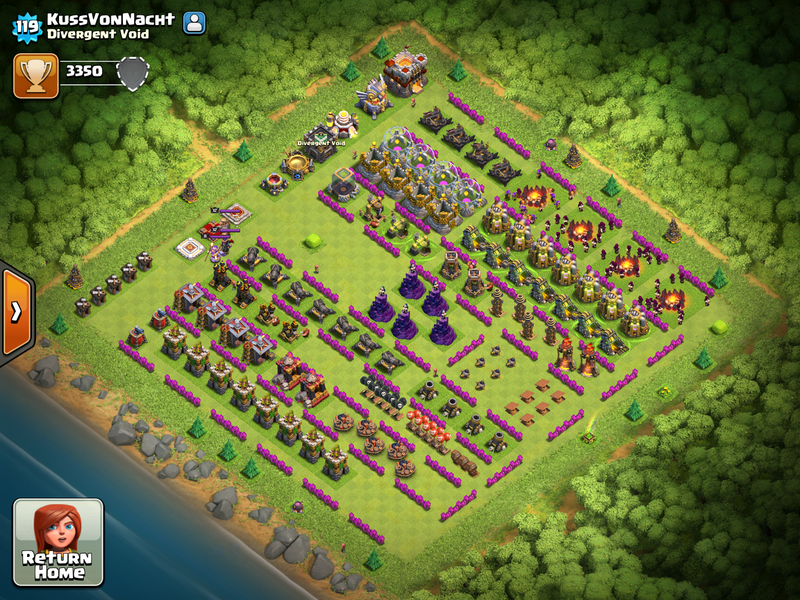 Of course, I only use this base when I'm actually under a shield (often while boosting collectors) or while raiding with free builders who can clean it up should an obstacle appear before I reset to my regular village base. In this particular version, you can see that the air sweepers are next in line to be upgraded and the archer towers come after them. That's consistent with my planning spreadsheet. I'm under a few days of shield and boosting collectors to get a little more resources for the air sweeper upgrades. What's next for this game? Well...once it reaches TH9 maxed level for remaining structures, I will shift gears to working on walls to level 8 and maxing the heroes. And before anyone cries foul - although rushed, this game always pulls in an equivalent or stronger TH11 opponent in clan wars. This is probably the biggest difference between strategic rushing and what is commonly referred to on the forums as "engineering". While engineered games run a very tight upgrade path designed to minimize overall war weight, a strategically rushed game is designed to get to the end-game as quickly and efficiently as possible. I don't typically use my spreadsheet until TH9 and up; the lower town halls can be managed relatively easily with just the shield base system I mention above. Once I move to the spreadsheet, though...things get kicked into high gear and become a lot more fun!